It is sweet to hear that Samsung has dropped the price for two of its upper-mid range smartphones. 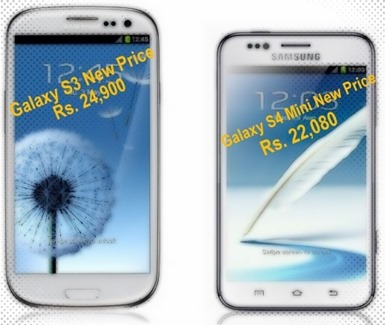 Samsung Galaxy S3, which was last year’s flagship model, has seen a price cut of Rs. 4000 and is now loitering at Rs. 25400. On Flipkart, the price is even lower at Rs. 24900. The phone was priced at Rs. 28900. Similarly, Samsung has reduced the price of Galaxy S4 mini to Rs. 23360 (Flipkart- Rs. 22080). The price for the phone on launch was Rs. 27990, which considering its specs was considered a bit on the higher side. As the festival season is upon us this does not come as a surprise. People in India often increase spend manifolds during the festival season and with such large reduction in price, Samsung has certainly made a dent in the choice column of anyone thinking of buying a mobile. While I do not expect people to flock to Galaxy S4 Mini much before, now with the reduced price, it justifies its price. S3 on the other hand has actually turned into a value for money gadget. It is already on Jelly Bean and is sure to get Android 4.4 (Kitkat). Also, the phone’s quad core processor is good to go for some time in the future. While the reduction might be because of the festivals, I do not expect Samsung to increase the price of the phones in the future. Interestingly though, now Samsung has created a void between Galaxy S4 and Galaxy S3. The former is priced at Rs. 37000 while the latter is at Rs. 25000 with Galaxy S4 Zoom at Rs. 27000 phone in between. While there are Galaxy Note 2 and Galaxy Mega at the Rs. 30000 price range, they are both phablets and cater to a particular taste only. Perhaps Samsung would realize this and launch another phone in this range or maybe it is expecting Galaxy Note 2 to fill the void. While Galaxy S3 started off on Android 4.0 (ICS), it has been upgraded to Jelly Bean. Samsung sure understand consumers psyche well, and their value for money phones are the reason why they have such significant market share! Nokia, Blackberry, Apple.. Are you guys listening! Trak.in AppWire: Amazon.in, Bill Check, MapmyIndia Explore, eSwaraj, Zypher & YeTheka! Samsung Explains Galaxy Note 7 Explosion Fiasco in Detail; What Really Happened!